BVs are used to collect multiple BAs into a single group. Similar to Centreon host groups, BV groups can be used in different Centreon BAM screens. Access restrictions (via ACL) for visualising BAs are managed by linking them to BVs, which are in turn linked to one or more Centreon Access Groups. A BV is not an indicator as such by which data can be calculated. The information in a BV depends on its content and is displayed in real time. Configure a BV in the Configuration > Business Activity > Business Views menu. Duplicate BVs: duplication number can be changed in the Actions column. Does not delete the BAs that are linked to it. BAs form the core of the Centreon BAM module. As aggregated indicators they are monitored by the software in real time. Based on a calculated value, the Centreon BAM system is able to notify users if a threshold is exceeded, revealing a problem with the IT service or application. This value between 0 and 100 (%) is often related to a service quality measurement. A variation in this value (called a level) is used to determine whether the modelized IT service or application is in an OK, Warning or Critical state. How does this level vary? A BA is linked to one or more KPIs that impact the health of the BA according to their state and the rules defined by the user. 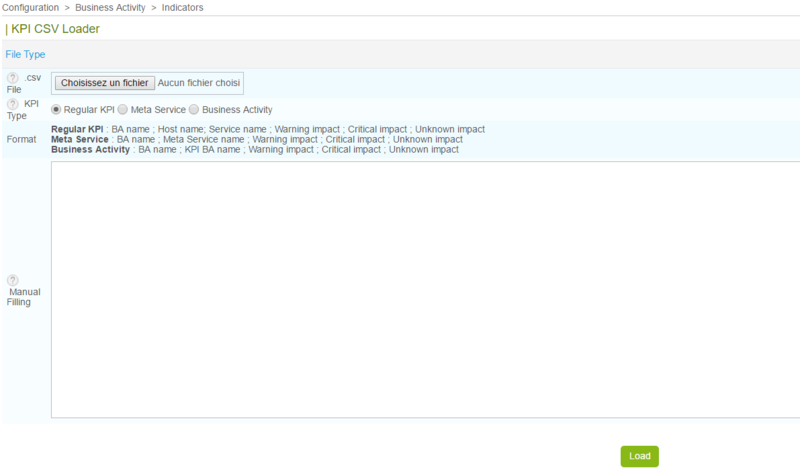 The BA is managed through the Configuration > Business Activity > Business Activity menu. Warning Warning threshold: refers to the warning condition of the BA. A notification can then be sent. Critical Critical threshold: refers to the critical condition of the BA. A notification can then be sent. Actions Actions can be performed (modification, activation/deactivation, display etc.). You can edit a threshold directly in the column by double-clicking on the value. Duplicate BAs (does not duplicate the KPIs). Deleting a BA is permanent. This includes all the data and KPIs linked to it. Activating the Event Handler (optional). The first tab contains the most essential (and mandatory) information linked to a Business Activity. The main parameters are described below. Warning: Between 100 and 0, the threshold below which the BA will switch to Warning status (orange) and send a notification (if configured). Critical: Between 100 and 0 (below the Warning threshold) below which the BA will switch to Critical status (red) and send a notification (if configured). Default reporting time periods used by Centreon BAM and Centreon MBI: Availability and event statistics will be calculated for this time period by default. Other reporting period can be added under the Extended information tab. Automatically inherit KPI downtimes: Whether or not the BA will inherit scheduled downtimes from its KPIs (more information below). Additional poller: The BA can be visible on a remote server as long as all its KPIs are available on that remote server. A BA inherits planned downtime from its KPIs only when its status is not OK. When a BA is in planned downtime due to KPI downtime inheritance: If the BA status switches to OK, planned downtime is stopped. When a BA is in planned downtime due to KPI downtime inheritance: If an impact comes from a KPI that has no planned downtime, the BA downtime is stopped. In order for the new BA to be calculated and monitored, you must regenerate the configuration on the scheduler and restart the monitoring services through the interface in the Configuration > Poller menu. The escalation and dependencies systems are the same as with other Centreon objects. However, a BA can only be dependent on another BA. Escalations are configured in the second tab panel of the configuration form. For more details on the escalation and dependency feature, consult the Centreon documentation. You can link a BA to one or more BVs either at the BV or BA configuration level. Icons: Business activities are represented by icons. Comments: A Business Activity can be commented. Extra reporting time periods used in Centreon MBI reports: Other service periods to be calculated for the BA (in addition to default periods). SLA thresholds: Used in Centreon MBI reports and widgets to manage the display of weather icons and colored cells. This option allows you to configure the automatic execution of a command whenever a status change occurs. A KPI can only impact a BA when status of its object (e.g., a service) is Hard (validated). The KPI can impact the health of a BA and change its value according to the KPI status. We recommend for you to use the standard impact mode (based on keywords Minor, Major, etc.) instead of the advanced mode based on numeric impact values, which involve more complex calculation. Any time a KPI status changes, the BAM engine evaluates the impact and subtracts its value from the BA health level. The minimum health of a BA is 0, even if the sum of its KPI impact is > 100. A service-type KPI whose host is Down will have a Critical impact. Activate the KPIs within their BA. Deactivate KPIs within their BA. Deleting a KPI does not delete the object referenced among the Centreon objects. Logs & previous availability statistics are not affected either. To add a KPI, click on the Add a KPI link, which takes you to the following form. To add a boolean rule: First create the boolean rule (see below), and then add the KPI. When you create or update a boolean rule, make sure to use the Restart method when pushing the configuration. In order to add multiple KPIs, click on Add multiple KPIs link which takes you to a data entry form. Events & availability statistics are automatically calculated daily. In case you modify the default reporting period, add an extra one or change BV association, you may need to rebuild the previously calculated data.